The Native American Mint’s robust Proof Silver Dollar Series was introduced years ago to catalog the many tribal nations found across the North American continent. Each release brings the images of new tribal figures and local animal species to the obverse and reverse sides, respectively, of proof silver coins issued by the Native American Mint on behalf of these tribes. 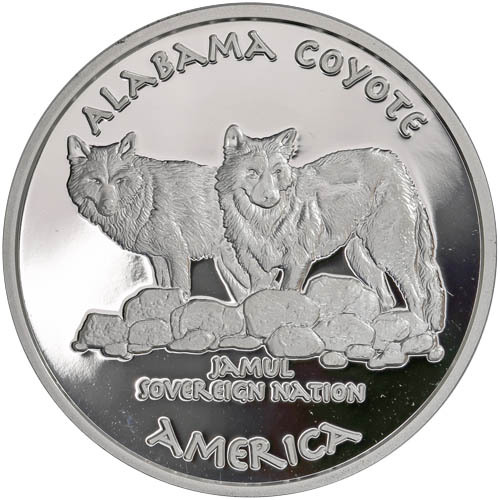 Today, 2019 1 oz Proof Silver Alabama Chickasaw Coyote Coins are available to you online at Silver.com. Available to ship inside of individual protective capsules! 24th coin in the collection and fourth release in 2019! The face value of One Dollar is fully backed by the Chickasaw Nation. Obverse includes the portrait of a Chickasaw tribal member. The reverse field features a coyote. Released for Alabama in the series. Issued for the Chickasaw Nation. Native American Mint Proof Silver Dollars are NOT legal tender in the US. The people of the Chickasaw Nation are recognized today as the 13th largest tribe in the federal registry in the United States. The members of the tribe are, historically, related to the Choctaw people and have a common history. During the Colonial Era in North America, the Chickasaw had various contacts with explorers and traders of French, English, and Spanish backgrounds. It was this contact that would eventually lead to strife though. All 2019 1 oz Proof Silver Alabama Chickasaw Coyote Coins are available to you with individual protective capsules. The coins have a face value issued as One Dollar, but the coins are not considered legal tender value as United States dollars (USD). Only the United States Mint has the authority, from Congress, to issue such coinage in America. 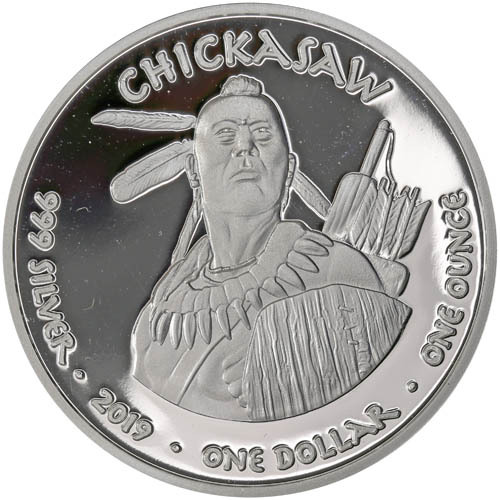 On the obverse of 2019 1 oz Proof Silver Alabama Chickasaw Coyote Coins is the portrait of a tribal figure. The Chickasaw Nation has a modern population of roughly 38,000 people, the vast majority of whom now live in Oklahoma. Formerly known as the Indian Territory, Oklahoma is not the original home of Chickasaw people. The Chickasaw, prior to the arrival of Europeans and expansion of America, lived in the western plains of the United States. The Chickasaw later moved east of the Mississippi River during the Colonial Era. The Chickasaw settled in northeastern Mississippi near Pontotoc Creek, as well as within Lawrence County in southern Tennessee and western portions of Alabama. For the reverse of 2019 Proof Silver Chickasaw Coyote coins includes the design of a coyote. There are a total of 19 different coyote subspecies in the world today, with most spread throughout North and Central America. The coyote is a versatile species that continues to adapt to environments altered by humans, and as of 2013 was spotted in urban areas of the Eastern US and a side of the Panama Canal never before seen. Please feel free to reach out to Silver.com. You can call us at 888-989-7223, chat with us live online, or email us directly.